There are over 300 million Facebook users in India alone, making it the leading country in terms of Facebook audience size. To put this into context, if India’s Facebook audience were a country then it would be ranked fourth in terms of largest population worldwide. 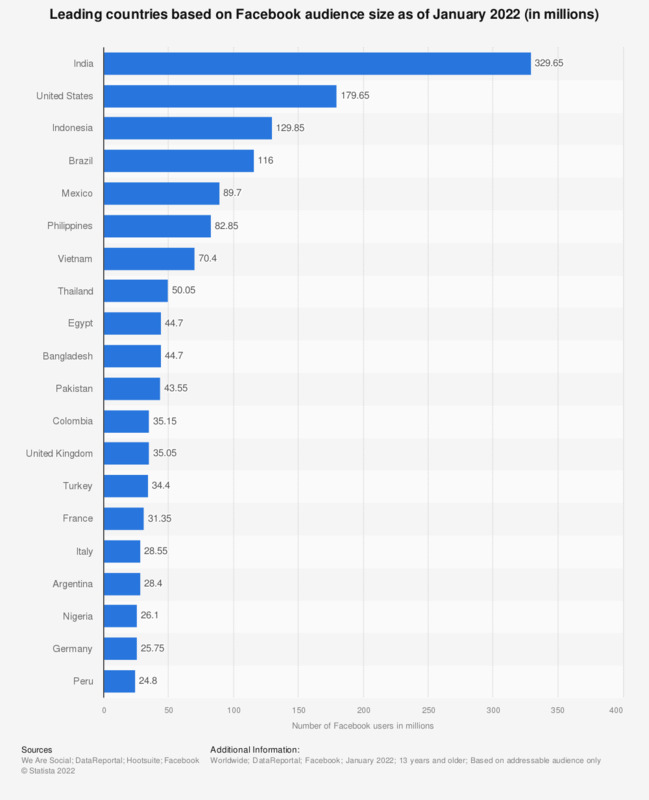 Apart from India, there are several other markets with more than 100 million Facebook users each: The United States, Brazil, and Indonesia with 210 million, 130 million, and again 130 million Facebook users respectively. With over 2.2 billion monthly active users, Facebook is the most popular social network worldwide. With an audience of this scale, it is no surprise that the vast majority of Facebook’s revenue is generated through advertising. Furthermore, over 90 percent of Facebook ad revenues are coming in via mobile. This correlates with recent data regarding the device usage of Facebook users: As of January 2019, it was found that 96 percent of active Facebook user accounts accessed the platform via mobile devices (either tablet or smartphone). Internet users who access their Facebook account via any device at least once per month. All values are estimates. Figures relate to addressable audience only, and may not include all users for each location or language.